Being environmentally conscious is important to Fujinetsu. Fujinetsu provides low-cost, energy saving systems that meet the needs of our customers. For people to be comfortable in their places of home and work, temperature regulation alone does not suffice. Multiple aspects of the working environment such as air flow, humidity, smell, sound and air cleanliness must also be taken into consideration. To further improve air comfort, Fujinetsu creates comfortable working environments through the use of high technology air density control. A commitment to the environment will always be a main focus of Fujinetsu. We are constantly striving to reduce carbon dioxide emissions, a major cause of global warming. To better reduce emissions from air- conditioning facilities, Fujinetsu utilizes energy cogeneration systems that reduce wasted energy, and a next-generation refrigerant known as R32, which lacks ozone depletion potential. Fujinetsu has developed high-quality, environmentally friendly air-conditioning systems that will maximize air comfort in a variety of working environments. Fujinetsu works hard everyday to provide everyone with a safe and reliable water supply. Water is an essential element to all people in their daily lives. Fujinetsu provides water feed, drainage, and sanitation facility, all of which are required for a system to properly draw water into a building, use that water, and return contaminated water to sewage for treatment. Water is utilized so often by people in their daily routine, it is often taken for granted. People wash their faces in the morning, take a shower, and maybe boil water for coffee. All of those activities require water supply, drainage, and sanitation facility to function. Because water is so important for people in their daily lives, we feel a rewarding sense of social contribution in being able to provide the required facility. Fujinetsu will satisfy the needs of our customers with water that is both safe and reliable. Fujinetsu provides refrigeration facility for special storage, as well as clean room facilities that benefit the fields of food and medicine. In a food factory, a refrigeration system is essential to store finished products and raw materials safely. Fujinetsu can provide facility for refrigeration and thawing, as well as the knowledge to properly achieve the cooling sought by customers. For the medical sector, Fujinetsu can also produce clean room facilities such as hospital operating rooms, that require places to be free of microorganisms and dust. Utilizing our experience and proven track record, Fujinetsu is ready to meet the refrigeration and clean room needs of our customers. To make warm bath related projects as convenient as possible for our customers, Fujinetsu offers proposal, design, construction, and maintenance of warm bath related facility. Unlike heating water with a kettle or pot, heating water on the scale of a public bath or pool is an involved process with many working parts. The water in such pools need circulation systems, with heat gradually being applied as it simultaneously cools. Filtration systems are also required to keep the water free from contamination. Fujinetsu has the specialized skillset and technology to design, construct, and maintain warm baths or pools of any scale. Remodelling can do wonders for any business. Fujinetsu offers renovation services suitable to the needs of our customers. The expected lifespan of a building is usually expected to be around 50-60 years. However, the lifespans of the facility and systems inside of a building are far shorter, and should be replaced or remodeled at regular intervals, around every 10-15 years. While external aging of a building may be visually apparent, such as stained walls or corrosion, detecting age-related damage to integral system components can be much more difficult. It can be difficult to visually diagnose degradation problems with the inside of a water receiving tank, piping, ducts, or anywhere else that is difficult to directly inspect. Even very capable facilities can begin to lose energy efficiency due to degraded water quality or contamination from the air. Day and night, Fujinetsu can maintain and manage air-conditioning systems in order to extend the lives of the buildings where they reside. While the lifespan of a building can be 50 years or more, the machinery inside, such as the fans and pumps of the air conditioning system, will be prone to failure or malfunction in much shorter scales of time. It is Fujinetsu’s mission is to extend the lifespan of factory buildings and the systems inside as long as possible. Through periodic inspection, overhaul, and repair, problems can be diagnosed and solved in a timely manner. With Fujinetsu, customers can be confident in the skills and experience of our specialsts to respond to, advise on, and solve any equpment problems that may arise. Fujinetsu supports HACCP with reliable equipment, facilities, and technology. HACCP is a quality control system for sanitation. It is an acronym that stands for Hazard Analysis and Critical Control Point. The system analyzes and monitors all stages of food production, from raw materials all the way to consumers, and identifies possible problem areas and critical points. Due to such rigorous monitoring and oversight, food product control and safety is greatly increased. Fujinetsu expands its reach with businesses in Southeast Asia. Peers doing business overseas is relatively rare in our industry. We believe that in order to maximize company performance, a global perspective must be utilized. In 2013, Fujinetsu recognized a golden opportunity and took a leadership position in expanding our business. In Southeast Asia, Fujinetsu entered Myanmar to broaden the market and expand the reach of our superior technology. Through our foreign operations, Fujinetsu provides air conditioning, sanitation, refrigeration, and related services. With superior, environmentally friendly technologies and facility, we will strive to create tangible savings for companies and social contributions to commities abroad. 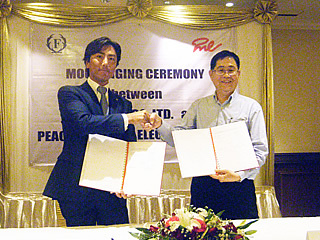 In October 2015, Fujinetsu Co., Ltd. entered into an alliance agreement with a Myanmar company, Peace Myanmar Electric Holding Co., Ltd. This agreement is aimed for our collaboration in the freezer and refrigeration facility business in Myanmar, including nurturing of engineers and other human resources. Fujinetsu and PME will consider expanding the scope of alliance, for instance, by establishing a joint venture company in Myanmar in the near future. 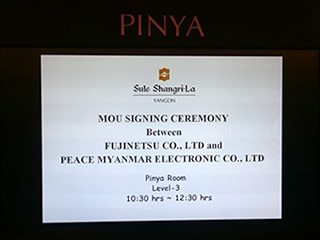 This picture shows a signing ceremony held at the Sule Shangri-la Yangon Hotel.